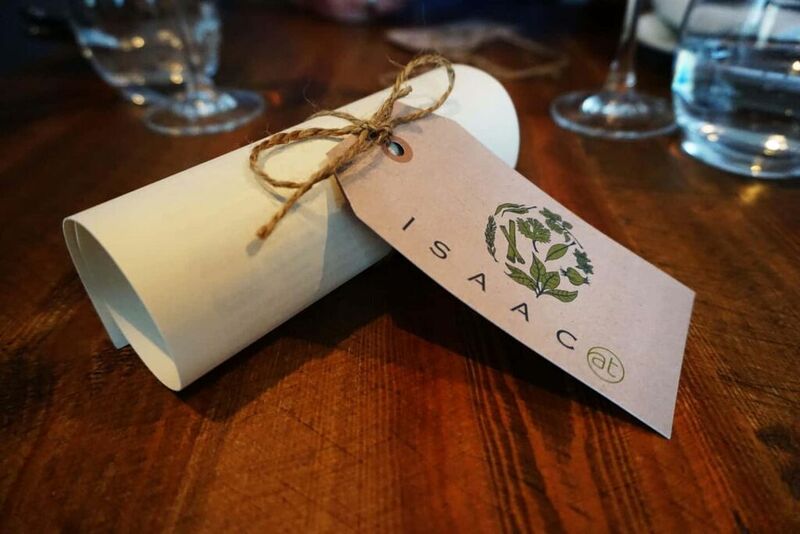 Well and truly tucked away on Brighton’s Gloucester Street sits the award-winning and critically acclaimed fine dining restaurant Isaac At. 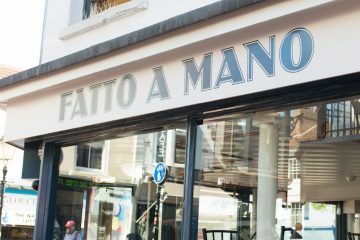 Now in its third year of trading and having recently climbed up a couple of notches claiming number 12 at Brighton’s top 20 restaurants awards, we figured it about time we checked the place out, and I am so glad we did. The whole experience was nothing short of spectacular, and not to be missed. 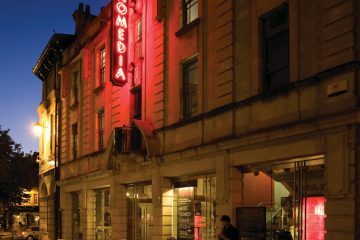 Arriving on a particularly cold evening and shuffling through the door with about 20 layers on, we received the warmest of greetings from Alex the front of house manager and waiter Colin, who were extremely patient as we de-robed. 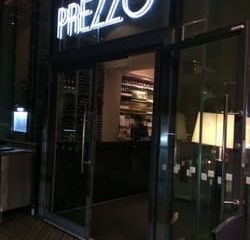 We were the firsts guests of the evening to arrive and the kitchen, which is the first thing you see as you walk in, was already a hive of activity, with Head Chef and proprietor Isaac busily and expertly going about making preparations for the evening ahead. As we were shown to our seats we had the chance to take in our surroundings. Alex explained they have been open since March 2015 but had recently renovated in August. The intimate space seats around 20 and that evening was laid out as tables of two or four with wooden details such as cutlery stands with enough perfectly polished silverware to keep you supplied throughout the evening. 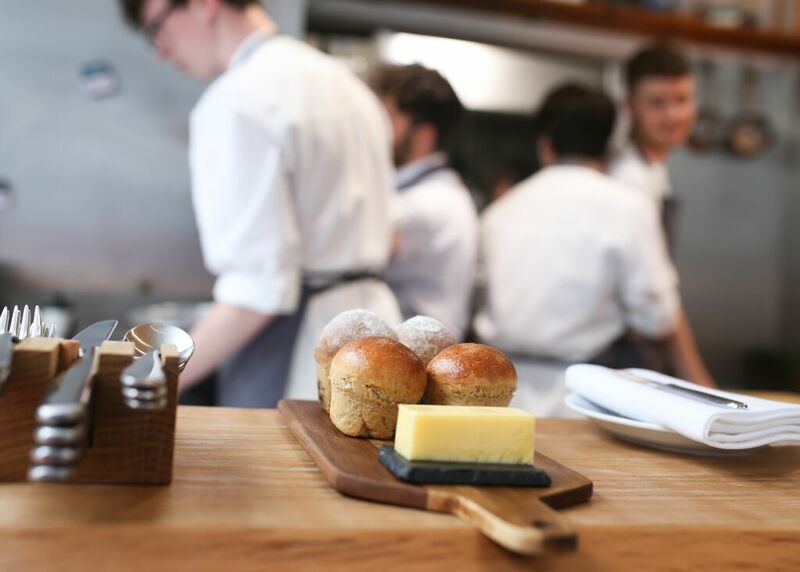 The menus were beautifully presented in rolls and tied with twine and a tag explains the restaurant’s ethos and passion for quality locally sourced ingredients and experimenting to create an ever evolving menu for our pleasure. All of which would become apparent throughout the evening. The décor is homely and welcoming and you are immediately drawn to the televisions in the corners of the room which display various camera views of the kitchen and preparation area. A great touch albeit a brave one! The menu, once unravelled, reveals three pages. The first is the actual menu, with each dish simply described with just the main ingredients. A list of all the ingredients being used throughout the night and where and how far they have come from follows and finally there is the drinks menu, which when studied you can see that everything is locally sourced. Taking a recommendation from Alex, we started off the evening with a wonderfully crisp sparkling Ridgeview Merret Bloomsbury from Ditchling. No sooner than it was delivered, one of the chefs appeared from the kitchen and presented us with a petite bowl of carrot and cider vinegar with rapeseed oil to sip on. I must admit this didn’t sound too appetising to me but it went down a treat. Wonderfully sweet and buttery smooth. Absolute nectar! The first of seven courses arrived as other dinner guests began to enter. Scallops, Horseradish and apple. The freshest, melt in your mouth scallops criss-crossed with thin strips of apple with droplets of horseradish and speckled with dehydrated scallop roe, which allows them to use the whole fish. An absolute delight! I expected the horseradish to overpower the other subtle flavours on the plate, but it was so smooth it complimented and exaggerated the essence of the main attraction. Sublime! We hadn’t finished marvelling over how impressed we were with the first dish when the second was humbly presented by one of the young chefs. Roast Carrot and Coriander. Slow roasted for three hours, with a heavily dehydrated centre which gives the carrot a meaty texture, blackened and intertwined with coriander branches. Served with a cold carrot puree which added an extra dimension to this hearty and soothing dish! Who would have thought such a glorious dish could be created out of a lowly carrot! In between courses Alex brought us out some warm treacle and stout loaf with South-Downs butter, and I have to say I have never tasted bread like it. Crunchy mahogany coloured crust reveals a complex yeasty but subtly sweet flavour with a background hit of hearty stout. This is complimented oh so well by the deliciously creamy South-Downs butter. Seeing our empty fizz glasses, Alex probed us to see if we were ready for a bottle of wine, and as he had been spot on with our first drink we asked him to recommend one. No disappointment here! Alex brought us a fantastic 2013 East-Sussex Davenport Pinot Noir which he said tasted of blue cheese as he poured us a taster… This made me rather dubious but what we got was an astonishingly good drop of wine! A light, fresh, but somewhat earthy rose that did indeed have a strange, but not at all unpleasant blue cheese after-taste. Apparently exclusively sold to Isaacs by the vineyard and only 120 bottles left in existence. The next plate of food was definitely a stood out to me. Pork Belly, Smoked Broccoli, Kohlrabi and Blackened Cabbage. Everything in this dish worked. The Pork was incredibly rich in flavour and succulent, cooked to perfection, the blackened cabbage grounding it even more so. The smoked broccoli puree subtly enhancing the meaty essence and the Kohlrabi giving it a satisfying twang. Incredible. This is where I have to mention how attentive Alex and Colin were to everyone in the room. Absolute masters of their craft, not once were we left with empty glasses, and keen to impart their quite frankly astounding knowledge about the menu, though never intrusive with it. The way they made sure everything ran smoothly and coordinated with the kitchen whilst ensuring every guest was having a good time was really something to behold. First up, a Bramley Apple and Sumac Sorbet. Sumac being a lemony Middle Eastern herb was a surprising addition, you would think this was not in-keeping with the restaurants passion for locally sourced produce. However Alex explained it grows wild as an alien species in the local Sussex countryside and they have a forager who goes out to pick it for them. A wonderful light, refreshing and zesty palate-cleanser which prepared our taste buds for the next desert, which we all agreed was a force to be reckoned with. Walnut Ice-Cream, Caramelised and Butter-Apple, topped with warm caramelised crumble and finished off with a wonderfully sweet and invigorating butter apple puree. There was so much going on with flavours, textures and temperatures. Every bite an adventure. A masterpiece. Last but not least we were given a Rhubarb and Almond drizzle cake. Soaked in syrup, with a crunchy crust and a warm gooey centre. Washed down with an espresso. A perfect satisfying end to the evening. Isaac at, is quite simply perfection. 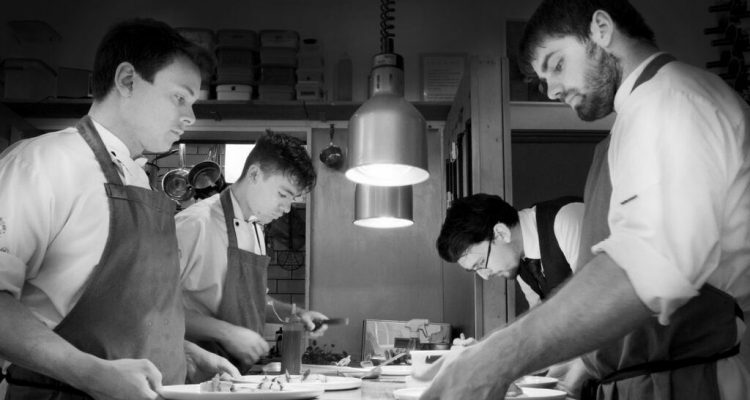 The team were exceptional, and worked energetically and harmoniously throughout the evening. Every course consistently excellent, with a huge variety of flavours and textures with a great deal of thought going into the presentation and composition of the dishes. 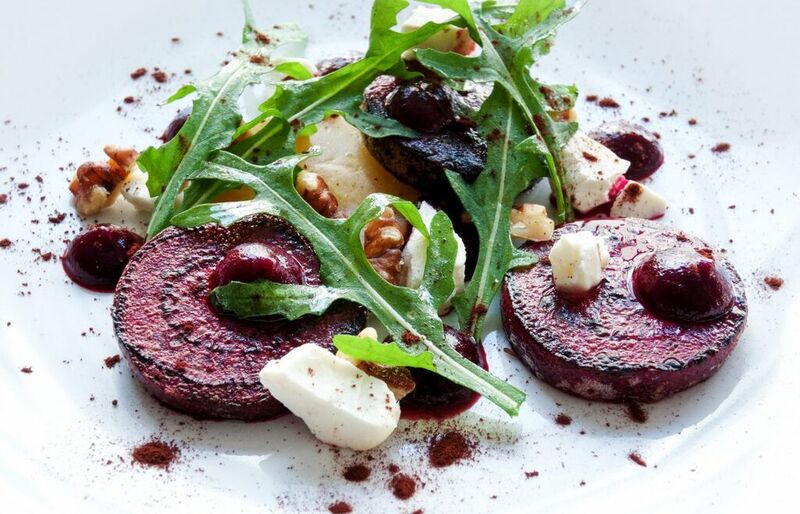 Their unwavering commitment to sourcing the very best local ingredients is commendable. The menu changes weekly, usually swapping out a dish a week. They cater for all dietary requirements and I had a look at the vegetarian and vegan menus and they are in-keeping with the menu we had, with just the odd ingredient substituted. 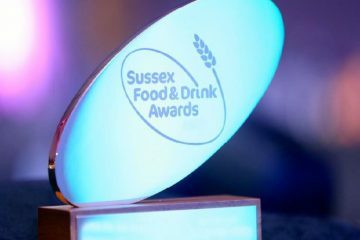 I am certain they will climb the list at the next Brighton’s top restaurants awards, perhaps even claiming the number 1 spot.